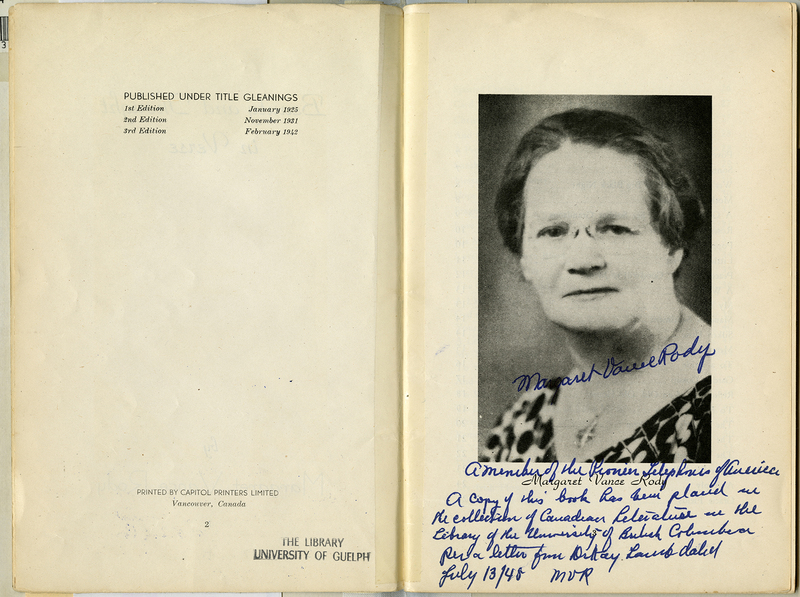 In preparing the post about Margaret Vance Rody’s Gleanings, I called in every edition I could find through the Inter-library Loans office at SFU. the 1925 edition does not appear to be extant any longer. For the other editions (1931 and 1942), I only asked for the Tables of Contents and publication information. I noticed, though, that Beauty in Thought and Verse, the 1942 edition published in Vancouver, contains a photo. The ILL issued another request for me, and kindly scanned the photo of Rody, as the volume was too delicate to remove from the library (usually I do the scanning at home). So here is a signed, labelled photo of the author to add to the information about editions I have posted previously. Her photo is up at the Canadian Writing Research Collaboratory, as well, ready to adorn our entry when we get them all up.